Choosing the right combination of pump, filter, pipe, and associated plumbing is one of the mysteries many first time pond builders face. You'll often see general recommendations in catalogs and magazine articles, but how do you use this information to actually design your circulation system? This page may help. The pond plumbing calculator helps you select a pump and plumbing combination that will deliver the flow rates necessary for your pond. Why do you need a pump in the first place? Well, you may not need one at all depending on what you plan to keep in your pond. But, if you plan to keep fish, particularly koi, in your pond, you may need a pump to both move the water over a waterfall or through a fountain for aeration, and to move the water through a filter to help keep the water clear and healthy for your fish. A pump circulates water against the resistance caused by gravity and friction. The pump has to overcome gravity to raise the water above the pond's surface -- the higher the water is pumped, the more resistance the pump will face, and the less water will be delivered per minute. The resistance to water flow caused by gravity is measured in feet and is called the static head of the circulation system. The static head is measured from the surface of the pond (or other water source) up to the height to which the water is eventually pumped (the top of a waterfall, for example.) The static head does not change whether the water is coming from a bottom drain or from a surface skimmer; it's the pond's surface that matters, not the placement of the inlet. The friction of the water moving through pipes also causes resistance to flow. A small diameter pipe causes more friction than the same length of a larger pipe, and the resistance increases as the flow rate increases. Because the resistance due to friction is not constant at all flow rates, it is called dynamic head. The dynamic head is also measured in feet (this may seem strange since it has nothing to do with height or gravity, but it's convenient to use the same units for both forms of resistance so that they can be combined and compared easily.) Dynamic head is also increased by changes in direction (such as elbow joints or curves in flexible tubing) and by any constriction of the plumbing system. Things like valves, pressurized filters, and pipe unions can all increase dynamic head. The total resistance to flow caused by gravity and friction combined is called the total dynamic head and, since it includes the dynamic head as a component, it increases as the flow rate increases. The total dynamic head (TDH) is the total resistance a pump will face when delivering a given rate of flow. In general, a given pump's flow rate will decrease as the TDH rises. This relationship between TDH and flow rate defines the "power curve" of a pump. Many pump manufacturers even publish graphs of head versus flow rate to help customers choose an appropriate pump for their application. But, using these graphs requires that you know the TDH for your proposed system. How do you compute the TDH for your circulation system? 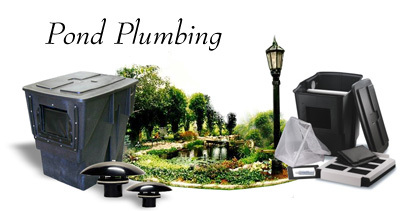 The pond plumbing calculator estimates the total dynamic head of your circulation system. Simply fill out the form below with the specs from your proposed circulation system, then click the button to find out how hard your pump will have to work (measured in feet of head.) Then, make sure you select a pump that exceeds your target flow rate at that head.